In a database data model, would a flatter model be more efficient, or too risky? Lets say I am creating a data model for an online seller. The company would have many warehouses across the country, just like Amazon. The disadvantage - there is a theoretical possibility the application could put bad data into the database. But perhaps I could trust the developers, who are senior level, to not do that. The advantage - SQL queries for reporting are now simpler. If I wanted to query how much total sales we are getting from a specific vendor, now there would be one less table to join. I would no longer have to join the Product table. This makes queries simpler. Is model #2 a good idea, or is the risk not worth it? Flattening the hierarchy is a good idea for reporting systems but not for OLTP in general. 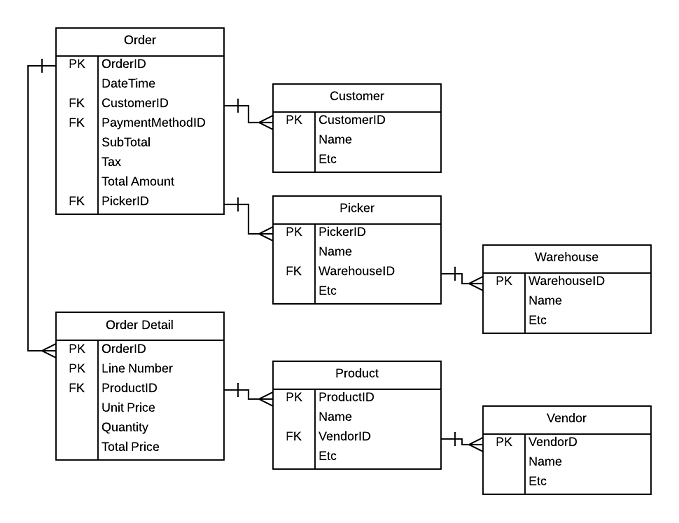 The concept shares some properties of the schema design technique for OLAP and Data Warehouse applications and is commonly known as Star Schema. The more flat the hierarchy is, the easier it is to write and build a query. Also, queries could run faster. The problem with such a design is that some business rules can't be detected on the daatabase level directly from the schema. For example, in the case of your second design, an Order row could have any combination of VendorID and ProductID whereas in the first design this can't happen. If your database is shared only by your application (not an enterprise application) and you control the code that does the update and you are willing to cover such missing business rule, and you have large data volumes, the 2nd design could be valid in your case. One important point for you to take care of, is that you have the lines representing most relationships are drawn in reverse. That is, when you have a one-to-many the FK the line with craw's feet shold be at the many's side. When dealing with data that's for the lack of a better category, enterprisy... never try to flatten the database. Database flattening is used only in real big applications where data isn't 100% integral. Where atomocity isn't guaranteed and doesn't need to be. Also the most important concept in having everything related and not flat is that you make a change in one place and everything trickles down/up/sideways (depending on how you've set up the database constraints). But with a flat approach, you have to always remember in which all tables do you have make changes, else your data breaks or your future 'reports' won't have accurate information. table1->relation->columns in relation->more relation->column in third level relation to address any column.. There are lots of stand-alone ORM tools for various languages. Not the answer you're looking for? Browse other questions tagged database-design data-modeling or ask your own question. 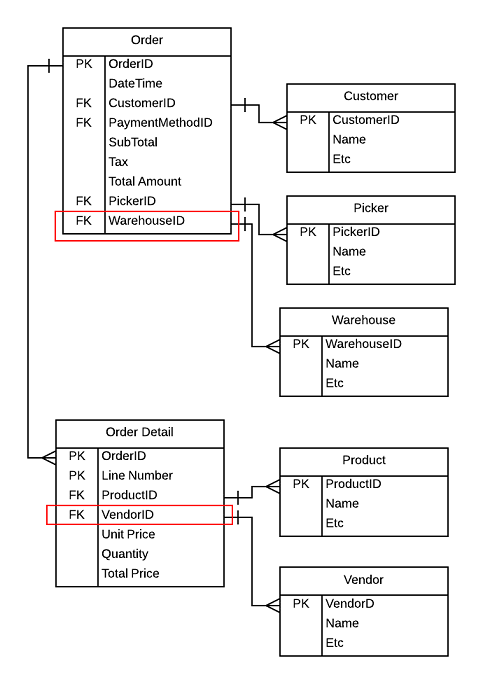 How to design a database model for a large data warehouse? How to avoid joins between fact tables in a star schema?